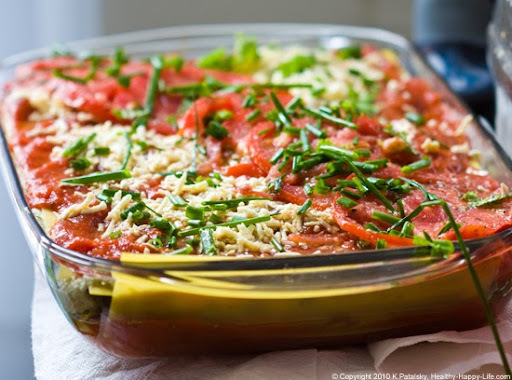 Vegetable Lasagna! Ricotta Nut Cheese. Marinated Tofu. 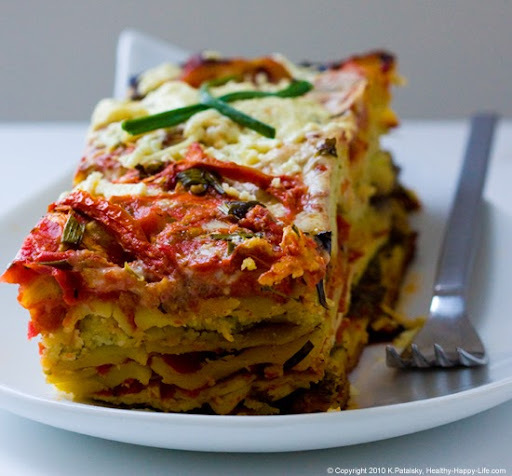 Hooray, I'm finally posting my recipe for Greenmarket Vegetable Lasagna with Ricotta Nut Cheese and Marinated Tofu. 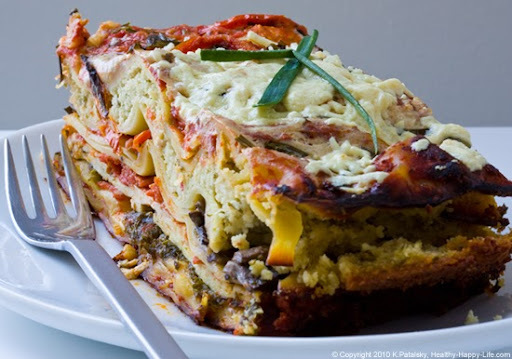 This family-favorite vegan entree features a rich cascade of layers that will wow you with each bite. Flavors like: creamy chive ricotta nut cheese, zesty garlic-marinated greens, tender tofu, savory mushrooms, sweet tomatoes and more. Vegan Ricotta "Cheese" - About a week ago I posted my recipe for the Chive Ricotta nut cheese. The feedback from you guys was amazing! A few of you have already tried it in your recipes with rave reviews. Vegan Version blogger even posted her lasagna success using my recipe here. 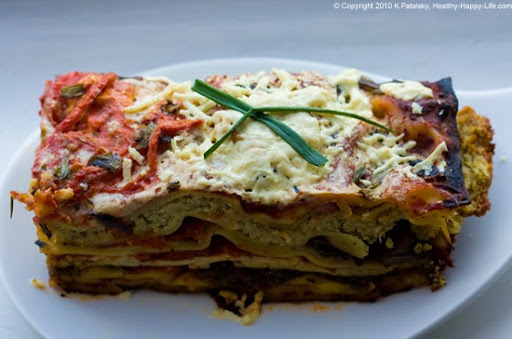 "Woke up early, prepped a Vegan Lasagna w/ my Greenmarket produce & Homemade Vegan Chive Ricotta. Thanking my Sat. nap for all my AM energy.."
My point: homemade lasagna is easy if you have time, energy and some inspiration sprinkled on top. You'll have to settle the energy/time issues yourself, but hopefully I can help inspire you. I tried to use as much organic, Greenmarket produce as I could.. 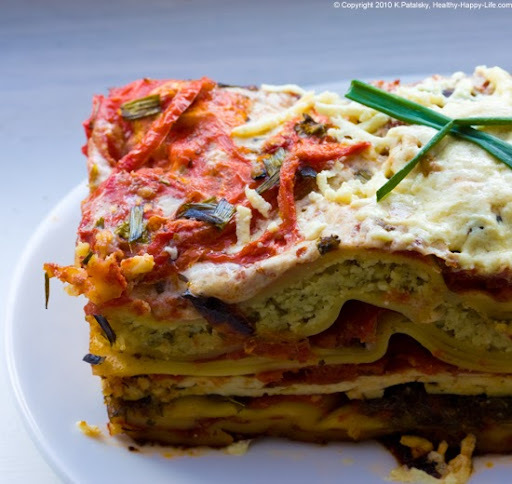 Here is my recipe with tons ofstep-by-step photos from my lasagna layering process. From start to finish. 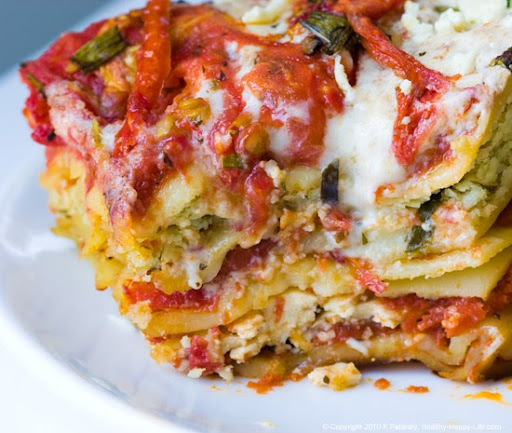 See the step-by-step lasagna slideshow here. Make-Ahead Note: For an easier process - make your ricotta nut cheese a day ahead and let it sit in your fridge until ready to use. 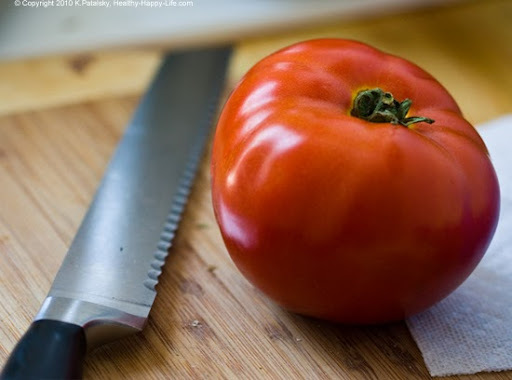 You can also marinate your ingredients overnight, the day before layering, for optimum flavor. However, you can easily do it all same-day in a relatively quick amount of time. From start to finish this lasagna prep took me about 45 minutes. That included making my nut cheese same-day. *I used mustard greens. Kale, spinach, etc work too. *vinegar note: if using apple cider or red wine vinegar you may want to add a splash of agave/maple syrup to sweeten your marinade up a bit. The balsamic vinegar should have enough sweetness on its own. 4. 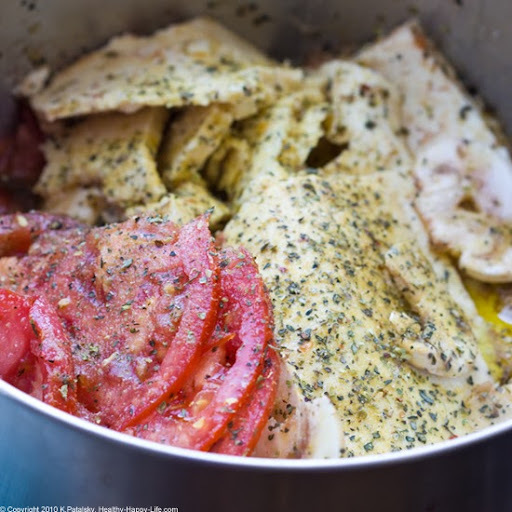 Place your sliced ingredients (tofu, mushrooms, tomatoes, greens) into your marinade bowl. Toss gently. Add more EVOO/vinegar if needed to cover ingredients. Allow to marinate at least 20 minutes. Otherwise you can prep this part for overnight marination. 6. 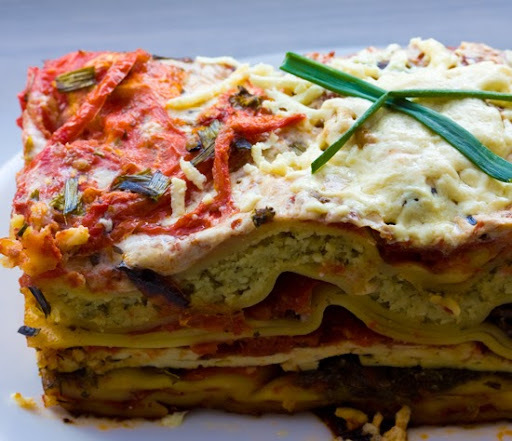 Begin building your lasagna. See the step-by-step pics for the best "building" details. But basically, sauce, noodles, sauce, greens, tofu, sauce, noodles, sauce, mushrooms, noodles, ricotta, noodles, sauce, cheese, fresh tomatoes, chives, black pepper. And done! 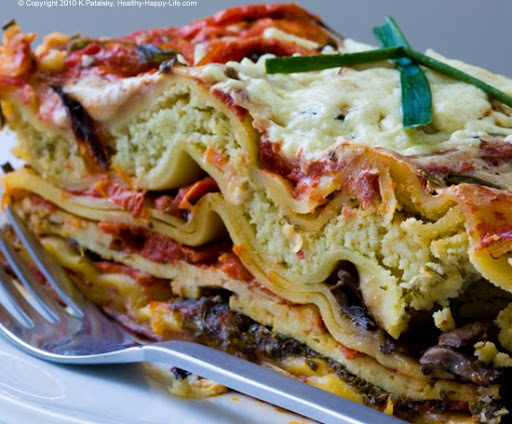 You can really build a lasagna however you'd like though. There are very few rules. And I actually poured a bit of my extra marinade over top to use as an extra moisture adder for my lasagna. Worked beautifully. 7. 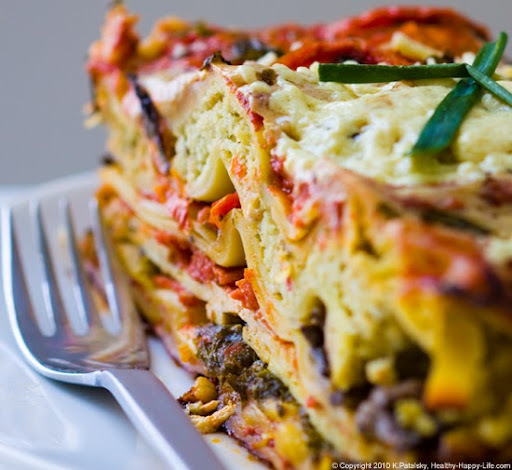 Cover your lasagna and store in fridge until ready to bake that day. Or bake in a preheated 400 degree oven for 45-60 minutes. Note: if baking lasagna from a chilled fridge, your baking time will be longer since the temp will be colder. Serve hot! Delicious leftovers for a few days too. I reheated my lasagna in the microwave for a quick and comfort-food cozy vegan lunch. So good! Cheese note: I didn't add a lot of Daiya cheese to this lasagna. I only had about 1/4 cup on hand. But for a super cheesy lasagna, you can always add more cheese if you crave it. However, remember it is still cheese! Even if it's vegan. Don't over-do it. The flavors from the veggies and vegan ricotta are bold, delicious and powerful - so you really don't need a lot of excess cheese. A nice sprinkle on top for texture is all I needed.